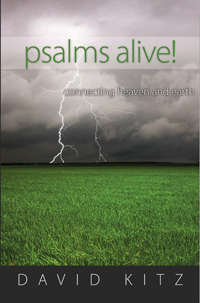 Posted by davidkitz in Psalm 11, Psalms, Psalms Alive! to shoot from the shadows at the upright in heart. The LORD is in his holy temple; the LORD is on his heavenly throne. He observes everyone on earth; his eyes examine them. the upright will see his face (NIV). Do you feel like your faith is under attack? It seems that everywhere there are people who are mocking those who have faith in God. Believers are openly ridiculed. We are blamed for every war since time immemorial. We are told that science has rock-solid evidence, while God followers rely on concocted myths handed down by unscrupulous manipulators. The righteous can do what David does in the first line of this psalm. David says, “In the LORD I take refuge.” For David, God was not a mystical concept. God was a rock solid reality. David had a memory bank full of experiences with the LORD. The LORD was David’s helper, healer and deliverer. In the tough times of life, God was there—was present in David’s life. The LORD brought victory for David over Goliath and over every enemy that exalted itself above God. The same can be true for you. Put on the full armor of God, so that you can take your stand against the devil’s schemes (Ephesians 6:11). Remember the LORD is on his heavenly throne. Nothing takes Him by surprise. The LORD is with you and He is watching your response. We need not be intimidated; we need not flee. We need to stand our ground like David and like Paul the apostle. The LORD is with us. Response: LORD, you are my refuge. Help me to stand my ground when my faith is under attack, and help other believers to do the same by the grace of Jesus. Our faith rests on you, Lord. Amen. Your Turn: Do you have a memory bank full of experiences with the LORD that you can draw on? you have become my salvation (NIV). Are you left handed? Today in western cultures being left handed presents some challenges since many devices are designed with right-handed people in mind. Try finding left-handed scissors next time you’re at a store. Good luck with that! Oh, and if you find them, expect to pay three times the price of a right-handed model. Often lefties don’t have it so good. Even today in Middle Eastern cultures being born left handed presents an enormous challenge. The right hand is used for eating food; the left hand is used for personal hygiene—bottom wiping. You dare not reverse that assigned role. Toddlers are strictly trained in this cultural practice. Usually left-handed children are forced to switch so they conform to the social norm. Making this switch plays havoc with the developing brain and often results in speech impediments such as stuttering, since this transition requires a complete rewiring of the child’s brain. The Bible was written by Holy Spirit inspired authors, but like authors today they were not blank slates. They wrote from their cultural perspective to the people of their time. As a result, readers today can easily miss or misunderstand concepts that were readily understood in their original context. Response: Father God, extend your right hand of blessing over me. Work on my behalf. Show me your mercy, your power and glory. Again and again I will give you thanks, for you answered me. Amen. Your Turn: Are you like the psalmist? Has the LORD spared your life for a purpose? Has God lifted His right hand to save and bless you?